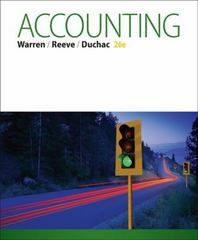 Accounting 26 Edition Market-leading Warren/Reeve/Duchac ACCOUNTING has been on the forefront of innovation and change based on the needs of today's teaching and learning environment. Warren/Reeve/Duchac ACCOUNTING 26E and CengageNOWv2 help elevate thinking with content that addresses each stage of the learning process from motivation to mastery. This integrated system motivates students to learn, provides practice opportunities to better prepare for exams, and helps students achieve mastery with tools to help them make connections and see the big picture. The Complete Learning System in ACCOUNTING and CengageNOWv2 is built around the way students use textbooks and online resources to learn, study and complete homework, allowing them to achieve ultimate success in this course. New to this edition, the authors have created innovative content that is focused on unique student and instructor needs before and after lecture - and the type of activities best-suited to each point in learning. New content such as the author-written Dynamic Exhibits allow students to change the variables in a scenario and see how a change ripples through the accounting system, helping students understand how concepts relate to one another. Dynamic Exhibits allow students to see connections and relationships like never before! The end goal of Warren/Reeve/Duchac ACCOUNTING and CengageNOWv2 is to elevate thinking and create more empowered and prepared students--ready to take on the rest of their educational and career goals.